Spring has sprung at Romney Marsh Wools, and lambing season is well underway. We caught up with Kristina Boulden, who runs the company in partnership with her husband Paul, to find out more. When does lambing start at Romney Marsh Wools? We keep traditional pure Romney Sheep which are happier lambing outside. At lambing time, we bring them into one big field (known as the lambing field) in stages. We always choose the fields closest to home so we can keep a close eye on them. Our sheep lamb throughout March and April and when they have lambed they are returned to their original fields within two or three days if the mum and lamb are doing well. Years ago, you’d see shepherds walking the sheep back along the road with lambs in tow. Nowadays they are taxied back in a livestock trailer! Do your ewes need anything specific to prepare for lambing? Early in January our ewes are all scanned to check and sort those carrying singles from twins, which means we can give them all the right amount of food they need. Later in the month and in preparation for lambing, ‘clatting’ takes place. This means removing the ‘clats’ (mucky wool) from the rear end of the sheep so that it easy to see what’s happening when lambing begins. This also helps the lamb to find the udder for that all important first feed. Paul’s Auntie (Ginny), one of our most important employees at lambing time, begins to prepare her lambing fields, constructing tri-corner pens which are used to house sheep and lambs that have been born later in the day. These traditional three gate pens are covered with old feed bags which cut the wind and give protection to the baby lamb. We also build temporary covered shelters in case of bad weather, and a special house for any orphaned lambs. We hope we can foster on some of the orphaned lambs to other sheep but there are always a few that become our pets. Romney Sheep are very easy sheep to look after and they’re excellent mothers with fantastic natural maternal instincts. We’re expecting 1,300 lambs this year so it will be a busy few months! Who is involved at lambing time? The main shepherds are my husband Paul and Auntie Ginny. We usually get a couple of veterinary students to help us out during lambing to gain some experience and lighten our load! My children Oliver (9) and Sophia (8) both help on the farm at the weekends and during the week before and after school, bottle feeding any lambs where the mother does not have enough milk. Both our children are so fortunate to grow up on a farm and they love going out with family members to help. As the farming wives, Paul’s mother and I assist wherever possible - our kitchens often become the hospitals for any poorly lambs that need extra care and attention. 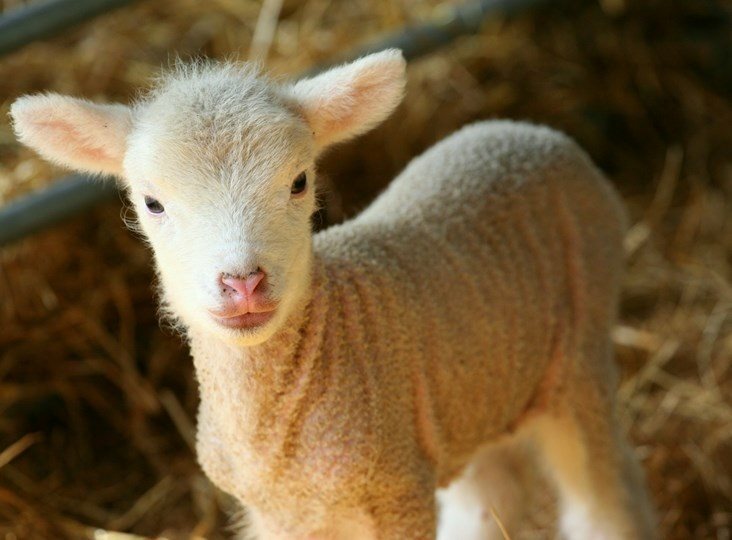 What do you love most about lambing? Whilst lambing is an incredibly busy time, it’s still our favourite time of year. Every year we end up with a few pet sheep - usually the orphaned lambs which are hand reared. Once the children have named them, they become a part of the family. This year we have ‘Hungry’ who was a tiny little lamb but a real fighter and loves food. Hungry now belongs to the children, joining Woolly who was adopted last year and is now due to lamb for the first time. Kristina and Paul live on the family farm, which was established in 1882 and includes over 1,300 hectares of land across the Romney Marsh in Kent. Kristina and her family keep over 1,000 Romney ewes, a breed native to the Romney Marsh and dating back to the 13th Century, along with a small flock of Saxoni Merino sheep.